Damage or loss of podocytes causes glomerulosclerosis in murine models, and mutations in podocyte-specific genes cause nephrotic syndrome in humans. Zebrafish provide a valuable model for kidney research, but disruption of pronephroi leads to death within a few days, thereby preventing the study of CKD. In this study, we generated an inducible model of podocyte injury in zebrafish (pod::NTR-mCherry) by expressing a bacterial nitroreductase, which converts metronidazole to a cytotoxin, specifically in podocytes under the control of the zebrafish nphs2/podocin promoter. Application of the prodrug metronidazole to the transgenic fish induces acute damage to the podocytes in pronephroi of larval zebrafish and the mesonephroi of adult zebrafish, resulting in foot-process effacement and podocyte loss. We also developed a functional assay of the glomerular filtration barrier by creating transgenic zebrafish expressing green fluorescent protein (GFP)–tagged vitamin D–binding protein (VDBP) as a tracer for proteinuria. In the VDBP-GFP and pod::NTR-mCherry double-transgenic fish, induction of podocyte damage led to whole-body edema, and the proximal tubules reabsorbed and accumulated VDBP-GFP that leaked through the glomeruli, mimicking the phenotype of human nephrotic syndrome. Moreover, expression of wt1b::GFP, a marker for the developing nephron, extended into the Bowman capsule in response to podocyte injury, suggesting that zebrafish have a podocyte-specific repair process known to occur in mammalian metanephros. These data support the use of these transgenic zebrafish as a model system for studies of glomerular pathogenesis and podocyte regeneration. The glomerular filtration barrier (GFB) of the kidney is composed of the fenestrated endothelial cells, the glomerular basement membrane, and interdigitating foot processes of podocytes that form the glomerular slit membrane. Several autosomal-recessive or -dominant mutations have been described as causes of monogenic forms of steroid-resistant nephrotic syndrome, a kidney disease caused by disruption of GFB and characterized by proteinuria, hypoalbuminemia, edema, and hyperlipidemia. Recessive mutations have been identified in nephrin (NPHS1),1 podocin (NPHS2),2 laminin β2 (LAMB2),3,4 CD2-associated protein (CD2AP),5 phospholipase C epsilon 1 (PLCE1),6 COQ6,7 PTPRO/GLEPP1,8 and MYO1E.9 Dominant mutations have been identified in α-actinin-4 (ACTN4),10 canonical transient receptor potential 6 ion channel (TRPC6),11,12 Wilms tumor suppressor gene 1 (WT1),13 CD2AP,14 and inverted forming 2 (INF2).15 Identification of these single-gene causes of nephrotic syndrome has revealed the essential components of the slit-membrane structure and signaling. The causes of >75% of nephrotic syndrome cases are still unknown, and treatment options are very limited and controversial. Treatment of these patients with multiple immunosuppressive and cytotoxic agents brings about considerable morbidity and mortality. All of the known monogenic mutations that cause nephrotic syndrome reside in podocyte-specific genes, suggesting that podocytes are essential for normal GFB function.16 This notion is confirmed by rodent models of inducible podocyte depletion, which demonstrate that podocyte damage alone is sufficient to cause proteinuria and glomerular sclerosis.17 Although many murine models for monogenic nephrotic syndrome have been extensively studied, mice or rats are not suitable for high-throughput screening of therapeutic agents because of the high cost and lack of efficiency. Recently, zebrafish have been recognized as a valuable vertebrate model system for kidney research, including the study of nephrotic syndrome and podocyte biology.18–20 Previous studies on zebrafish kidney mainly focused on the embryonic pronephros, which consists of only one pair of nephrons and is structurally and functionally much simpler than the mesonephros of adult fish and the metanephros of mammals.21 Disruption of pronephroi usually leads to death of zebrafish within a few days, which prevents the study of symptoms of CKDs, such as focal segmental glomerular sclerosis or podocyte regeneration. High-molecular-weight FITC-dextran has been used to monitor GFB leakage in zebrafish,18,20 but this method involves microinjection, histologic sectioning, and imaging and is labor-intensive if applied to high-throughput screening. To overcome these limitations and to establish the zebrafish kidney as a new model system for nephrotic syndrome and podocyte regeneration, we have generated a zebrafish model of inducible podocyte injury for both pronephros in larvae and mesonephros in adults. Induction of podocyte injury by metronidazole (MTZ), which is converted to a cytotoxin by the bacterial nitroreductase (NTR)22 transgenically expressed in zebrafish podocytes, leads to GFB damage. This can be assessed with a novel proteinuria assay we describe here and by examining phenotypes mimicking human nephrotic syndrome. In addition, this inducible podocyte injury model allows us to observe that partially damaged glomeruli in adult zebrafish kidney exhibit a podocyte-specific postinjury response similar to that of the mammalian metanephros. Thus, our transgenic zebrafish model can serve as a new model system that is relevant to human glomerular diseases and can be used to study podocyte regeneration. To study renal glomerular structure and function in zebrafish, we generated the transgenic line pod::NTR-mCherry, in which mCherry is expressed specifically in podocytes under the control of zebrafish podocin (pod) promoter23 (Figure 1A). In this line, pronephric podocytes and their major foot processes were readily visible under laser scanning confocal microscope (Figure 1, B and C). Because the zebrafish mesonephros is rather transparent and accessible for fluorescence imaging (Figure 1D), we were able to resolve the three-dimensional structure of zebrafish mesonephric glomerulus. By combining with a transgenic line (flk1::GFP) that labels the vascular endothelium with GFP fluorescence, we found that the glomerular capillaries had multiple branches (Figure 1E) and more than two vessels ran into a single glomerulus (Supplemental Movie 1). On the basis of confocal reconstruction of the glomerulus, we determined that each mesonephric glomerulus contained 42±8 (mean ± SD) podocytes (n=6) and the glomerular volume per podocyte was 7709±1261 (mean ± SD) µm3 (n=6). This established the use of transgenic zebrafish and laser scanning confocal microscopy as a rapid and convenient method to visualize glomerular structure without histologic sectioning. Transgenic zebrafish expressing NTR-mCherry in pronephros and mesonephros. (A) Schematic graph illustrating the transgene structure of pod::NTR-mCherry. Tol2-L and Tol2-R are Tol2 transposon elements to facilitate the transgenesis. SV40 polyA is the polyadenylation signal sequence of simian virus 40. (B) Dorsal view of a 5-dpf larva. The pair of pronephric glomeruli (arrow) are marked with mCherry fluorescence (red). (C) Confocal image of pronephric glomerulus. The cell bodies (arrows) and major foot processes (arrow heads) of podocytes are visible by mCherry fluorescence. (D) Ventral view of medial nephron-dense region of mesonephros in adult zebrafish. Multiple mesonephric glomeruli (red) are labeled with mCherry fluorescence. (E) Confocal image of a mesonephric glomerulus in flk1::GFP/pod::NTR-mCherry double transgenic fish. Glomerular podocytes are red and endothelial cells are green. Branching of glomerular arterioles is notable (asterisks). Podocytes are essential to maintain normal GFB function in mammalian kidney. We established an inducible podocyte injury model in zebrafish as a new animal system for the study of glomerular function and pathogenesis. In the transgenic line pod::NTR-mCherry, the bacterial NTR is expressed specifically in podocytes of both pronephros and mesonephros (Figure 1), which can reduce the prodrug MTZ, converting MTZ into a cytotoxin.22,24 After the application of 10 mM MTZ, pod::NTR-mCherry larvae developed severe periocular edema and whole-body edema (Figure 2, A–F), similar to human nephrotic phenotypes. Increased apoptosis was observed in the pronephric glomeruli in MTZ-treated pod::NTR-mCherry fish, shown by the activated caspase-3 staining, an essential mediator of apoptosis (Figure 2, G and H). 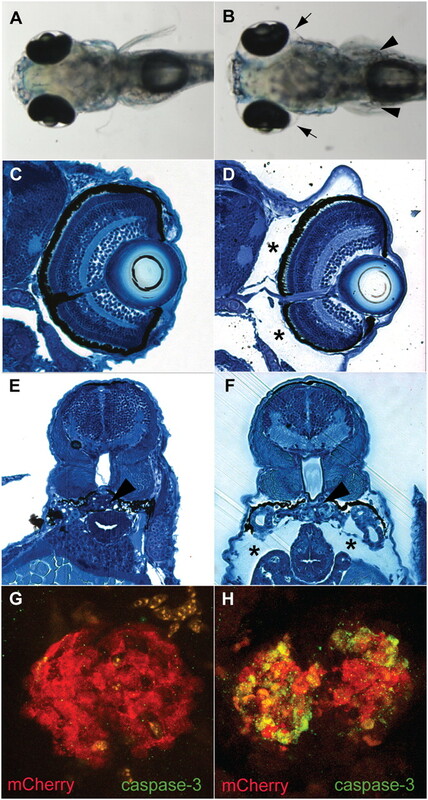 In addition, podocyte injury by application of MTZ to adult pod::NTR-mCherry transgenic fish also led to severe edema (Figure 3, A and B). Fluorescence microscopy showed a decrease of mCherry fluorescence, suggesting podocyte loss in MTZ-treated fish (Figure 3, C and D, and Supplemental Figure 1); protein casts were also observed in the Bowman space in MTZ-treated fish (Figure 3, E and F), which indicated that the glomerular filter barrier was impaired after podocyte injury. Transmission electron microscopy revealed podocyte foot-process effacement in mesonephros of MTZ-treated fish but not in DMSO-treated control fish or MTZ-treated nontransgenic fish (Figure 3, G–J and Supplemental Figure 2). Thus, our results demonstrate that podocytes are indispensable for the glomerular filter barrier function in zebrafish kidney and phenotypes resembling human nephrotic patients are reproduced in this zebrafish model of podocyte injury. MTZ-induced podocyte injury in 5-dpf pod::NTR-mCherry transgenic fish. (A) pod::NTR-mCherry fish without MTZ treatment have normal morphologic features (dorsal view). (B) MTZ treatment of pod::NTR-mCherry fish leads to severe edema (arrowheads). (C and E) Cross-sections show normal morphologic features of untreated pod::NTR-mCherry transgenic zebrafish. (D and F) Note the periocular edema (asterisks) and edema around the body (asterisks). Arrowheads in E and F indicate the pronephric glomeruli. (G and H) Activated caspase-3 is detected in the pair of fused pronephric glomeruli in MTZ-treated pod::NTR-mCherry fish (H) but not in untreated wild-type fish (G). MTZ-induced podocyte ablation leads to edema, glomerular leakage, and podocyte foot-process effacement in mesonephric glomeruli of adult pod::NTR-mCherry transgenic fish. (A and B) Induction of podocyte ablation by 24 hours of 10 mM MTZ in pod::NTR-mCherry fish causes severe edema. 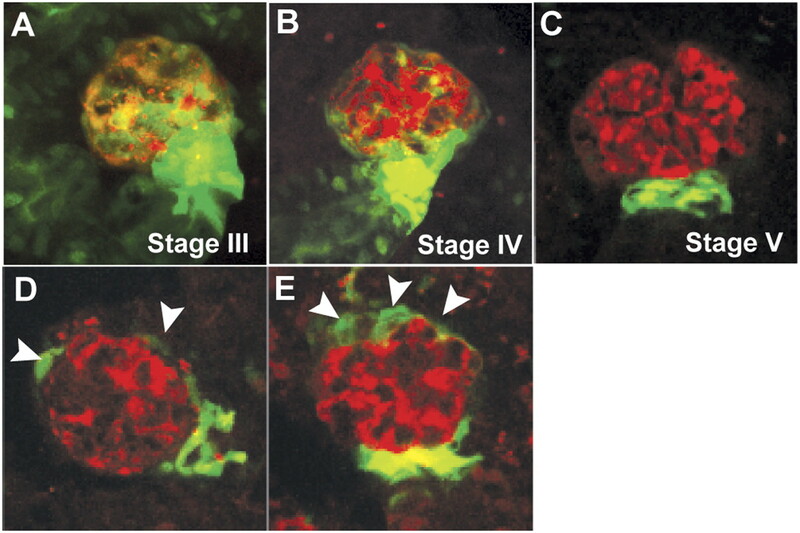 (C and D) Fluorescent images show the loss of pod::NTR-mCherry–expressing podocytes (red) in MTZ-treated mesonephric glomeruli. (E and F) Histologic sections reveal swelling of MTZ-treated mesonephric glomeruli and protein casts (arrowheads) in the Bowman space. (G and H) Electron microscopy reveals the swelling of glomeruli and a protein cast (arrowheads) in the Bowman space after MTZ treatment. (I and J) Higher-magnification images show podocyte foot-process effacement (arrowheads) in MTZ-treated fish. Note the protein cast in the Bowman space (BS) in MTZ-treated glomeruli. One of the major symptoms indicative of defective GFB is proteinuria. Although monitoring of albuminuria is well established and widely used to examine GFB function in humans and other mammalian models, the zebrafish ortholog of albumin has not been identified by sequence homology and hence no albuminuria assay has been established. High-molecular-weight FITC-dextran has been used to aid in the detection of GFB defects in zebrafish pronephros.18,20 However, this method is rather labor-intensive and has not been successfully applied to mesonephric GFB function in adult zebrafish. To overcome these difficulties, we reasoned that using GFP as a tracer of proteinuria has several advantages: (1) It is easy to generate transgenic fish expressing GFP in serum of zebrafish; (2) transgenic fish can be produced in large quantities to avoid injection of tracer into each individual fish; (3) GFP can be detected by ELISA with high sensitivity and specificity; and (4) GFP may permit direct examination of proteinuria by fluorescence imaging. Because the GFB function is based on the size and charge selectivity for serum proteins, we designed the tracer protein to be as similar to albumin as possible. We isolated the cDNA for vitamin D–binding protein (VDBP) in zebrafish, a homologue closest to mammalian albumin, and fused its coding sequence to generate a C-terminus GFP-fusion protein that has an estimated molecular weight of 79.6 kD, close to that of mammalian albumin (human albumin: 66.5 kD; mouse albumin: 66.7 kD). In addition, the isoelectric point of vitamin D-binding protein–GFP fusion protein is 5.97, similar to that of mammalian albumin (human albumin: 5.67; mouse albumin: 5.69). Thus, VDBP-GFP may be used as a tracer for both size and charge selection of glomerular filtration barrier. We then generated a transgenic fish line, l-fabp::VDBP-GFP, to express this fusion protein under the control of a liver-specific fatty acid–binding protein (l-fabp) promoter (Figure 4A) such that it is produced in the liver and secreted into blood (Figure 4B), as is the endogenous VDBP. Metronidazole-induced podocyte injury causes leakage of VDBP-GFP into proximal tubules in the pronephros of pod::NTR-mCherry/VDBP-GFP double-transgenic zebrafish larvae. (A) Schematic graph showing the l-fabp::VDBP-EGFP (enhanced green fluorescent protein) transgene. (B) Side view of 5-dpf l-fabp::VDBP-EGFP transgenic larvae. GFP fluorescence is evident in vasculature. (C) Side view of l-fabp::VDBP-GFP transgenic fish treated with 10 mM MTZ at 3–4 dpf shows no GFP accumulation in tubules (arrowhead). (D and D’). Cross-section of VDBP-GFP transgenic fish treated with 10 mM MTZ at the dash line in C stained with GFP antibody in fluorescence view (D) and merged with bright-field view (D’). Note GFP is absent in proximal tubules (arrowheads) and pronephric glomeruli (arrow). L, liver. Scale bar, 75 um. (E) Treatment with 10 mM MTZ on pod::NTR-mCherry/l-fabp::VDBP-GFP double transgenic fish at 3–4 dpf results in accumulation of VDBP-GFP in pronephric tubules (white arrowhead) due to glomerular leakage, compared with control (C). Note the reduction of GFP fluorescence in the head region of MTZ-treated fish (E) due to the loss of VDBP-GFP through damaged pronephros. (F and F’) Cross-section of MTZ-treated pod::NTR-mCherry/l-fabp::VDBP-GFP double transgenic fish at the dash line in E after GFP immunostaining in fluorescence view (F) and merged with bright-field view (F’) showing that GFP fluorescence is accumulated in proximal tubule (arrowheads) and pronephric glomeruli (arrow). L, liver. (G and H) Percentage of larvae manifesting VDBP-GFP accumulation and edema at 24 hours (G) and 48 hours (H) after MTZ treatment. (I) ELISA measurement of GFP in water after 24 hours of MTZ treatment on 3-dpf double transgenic fish. To test whether VDBP-GFP will leak through the GFB of pronephros, we treated pod::NTR-mCherry/l-fabp::VDBP-GFP double transgenic fish that were 3 days post-fertilization (dpf) with MTZ to induce podocyte injury. After 24 hours of treatment with MTZ, none of the l-fabp::VDBP-GFP transgenic fish (n=0/11) treated with 10 mM MTZ had the accumulation of GFP fluorescence in proximal tubules (Figure 4, C, D, and D′, and Supplemental Figure 3). In contrast, the majority of pod::NTR-mCherry/l-fabp::VDBP-GFP double-transgenic larvae treated with 5 mM or 10 mM MTZ showed strong accumulation of GFP fluorescence in the proximal tubules of pronephros along with edema (for 5 mM: 65%, n=31; for 10 mM: 90%, n=29) (Figure 4, E, F, and F′). This is because VDBP-GFP leaked through the damaged GFB and was reabsorbed by the epithelial cells in proximal tubules through Megalin-mediated endocytosis.25 Twenty-four hours after the withdrawal of MTZ, edema phenotype persisted (for 5 mM: 68%, n=31; for 10 mM MTZ: 90%, n=29), but GFP had disappeared in proximal tubule for the 5-mM or 10-mM MTZ-treated group (Figure 4F). This is possibly due to the clearance by tubular epithelia or recycling into the blood and the depletion of serum VDBP-GFP. Alternatively, excessive protein accumulation in the proximal tubules may have caused tubular damage, thereby preventing reabsorption of proteins. These data demonstrated that podocyte injury led to VDBP-GFP leaks through GFB as an indication of proteinuria, mimicking human nephrotic phenotype. None of the larvae treated with 2 mM MTZ (n=40) developed edema after 24 hours of treatment, although 25% of the embryos had already shown visible GFP accumulation in the proximal tubule (Figure 4E); 24 hours after the withdrawal of MTZ, the percentage of larvae with edema rose to 43%, whereas only 8% showed GFP accumulation in tubules (Figure 4F). The latter presumably occurred because moderate podocyte injury led to prolonged low-level protein leakage through GFB, which did not rapidly deplete VDBP-GFP in serum. Larvae treated only with 0.1% DMSO (n=21) as a negative control never developed any edema or GFP accumulation in tubules (Figure 4F). These data showed that the serum protein leakage occurred before the edema phenotype developed, suggesting that edema is the consequence of loss of serum proteins. To develop a quantitative measurement of proteinuria for zebrafish, we then used ELISA against GFP to measure the excretion of VDBP-GFP into water by the double transgenic larvae after 24 hours of MTZ treatment (Figure 4G). A significant amount of GFP could be detected in water by ELISA for larvae treated with 5 mM or 10 mM MTZ, although 0.1% DMSO, 1 mM or 2 mM MTZ-treated group did not show significant excretion of GFP (Figure 4G), consistent with the GFP accumulation in tubule and the edema phenotype. To test whether VDBP-GFP can serve as a proteinuria tracer in mesonephros of adult zebrafish, we treated the double transgenic adult fish with different concentrations of MTZ for 24 hours and examined the mesonephric kidney under fluorescence microscope every 24 hours thereafter for 5 days (Figure 5, A–D). 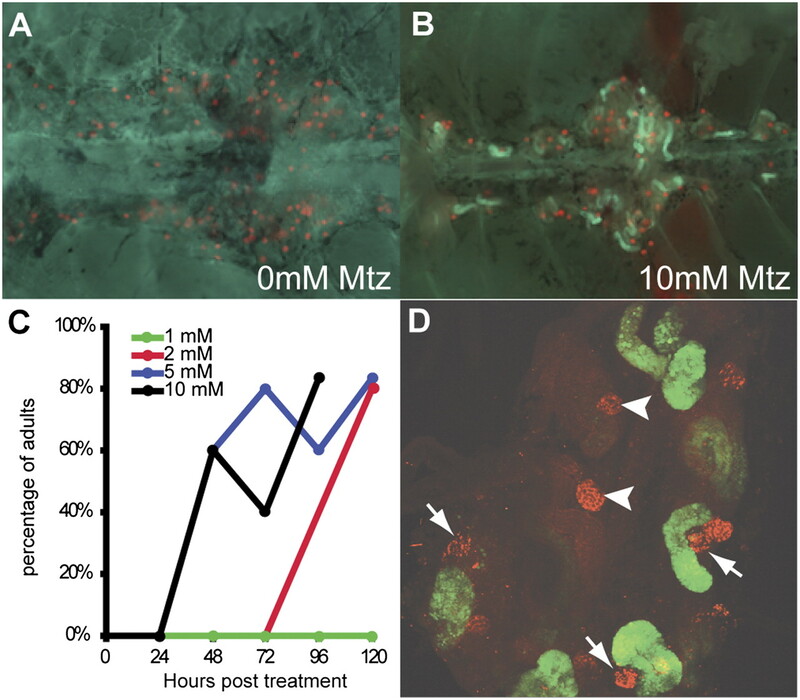 We found that the GFP accumulation in proximal tubules could be induced by MTZ in a dosage-dependent manner (Figure 5C): Fish exposed to 5 mM (60%) or 10 mM MTZ (60%) started to show GFP accumulation 48 hours after treatment; those exposed to 2 mM (40%) took 72 hours to develop GFP accumulation, whereas for those treated with 1 mM MTZ, no GFP accumulation was observed within 5 days after treatment. High-power confocal imaging also revealed that GFP accumulation occurred only in damaged nephron but not nephrons with intact glomeruli (Figure 5D). These data solidly confirmed that VDBP-GFP accumulation in proximal tubules can be used as a functional readout of defective GFB in mesonephros. MTZ-induced podocyte injury causes leakage of VDBP-GFP into proximal tubules in the mesonephros of pod::NTR-mCherry/VDBP-GFP double transgenic fish. (A) Ventral view of mesonephroi of adult double transgenic fish. (B) After 24 hours of 10 mM MTZ treatment, VDBP-GFP leaks through glomeruli and is reabsorbed in the proximal tubules. (C) MTZ-induced podocyte injury causing VDBP-GFP accumulation in proximal tubules in a dose-dependent manner. (D) Confocal image showing damaged mesonephroi and VDBP-GFP accumulation in proximal tubules. Note that severely damaged nephrons (arrows) exhibit VDBP-GFP accumulation in the proximal tubules, whereas the two nephrons (arrowheads) that are not severely damaged have little VDBP-GFP accumulation. We have previously shown that zebrafish continuously generate new mesonephric nephrons throughout life and that such neo-nephrogenesis can be induced by gentamicin-mediated kidney injury.23 The zebrafish-specific WT1 homologue, wt1b, is highly expressed in nephrogenic precursor cells and can be used as a marker for kidney regeneration in zebrafish.23 We found that wt1b was expressed throughout the proximal tubules and the glomerulus in developing nephrons (Figure 6, A and B), but its expression was downregulated and restricted to the urinary pole of the glomerulus in matured nephrons (Figure 6C and Supplemental Movie 2). This is reminiscent of the location of CD24+CD133+ renal progenitors within human glomeruli.26 To see whether wt1b expression may serve as a reporter for glomerular repair or podocyte regeneration, we examined the expression of wt1b::GFP in double transgenic fish pod::NTR-mCherry/wt1b::GFP after induced podocyte injury (Figure 6, D and E, and Supplemental Figure 4). In partially damaged glomeruli, wt1b::GFP was found in cells surrounding the Bowman capsules, similar to that of developing nephrons, although there was no visible GFP expression in the tubules. This finding indicates that these nephrons are indeed already fully developed. Thus, podocyte damage triggered wt1b expression that recapitulates the developmental process, suggesting a glomerulus-specific response to podocyte injury. Postinjury response in zebrafish mesonephric glomeruli. (A–C) The distribution of wt1b::GFP-expressing cells (green) during the different developmental stages of glomeruli in adult zebrafish23 resembles that of renal progenitors in adult human glomeruli.26 With the maturation of the nephron, wt1b::GFP expression is diminished in the epithelial cells except at the urinary pole of the Bowman capsule. The podocytes (red) are labeled with mCherry fluorescence. (D and E) After MTZ-induced podocyte injury, wt1b::GFP-expressing cells (arrowheads) are expanded toward the vascular pole of the Bowman capsule of mesonephric glomeruli in zebrafish, suggesting a podocyte repair mechanism similar to that in mammals. In this study, we generated a transgenic zebrafish model that allows for inducible podocyte injury using MTZ and established a novel proteinuria assay using a transgenic fish expressing GFP-tagged serum protein VDBP. Taking advantage of these transgenic lines, we were able to detect serum protein leakage through GFB after podocyte injury by fluorescence microscopy and ELISA. In addition, we observed that podocyte injury in zebrafish mesonephros induces wt1b expression within glomerulus, suggesting a potential podocyte-repair process. The zebrafish pronephros has been successfully used as a model system for the study of kidney development and diseases for more than a decade.21,27 The mesonephros has been less studied, although it is more closely related to human metanephros. Our finding that podocyte injury in pronephros and mesonephros in zebrafish reproduces multiple phenotypes similar to nephrosis in humans strongly suggest that not only pronephric but also mesonephric glomeruli have functional homology to metanephros in terms of glomerular function and thus can be used as animal models for the study of glomerular function and disease. Moreover, we have established a new ELISA-based functional assay for GFB in zebrafish that can be applied to high-throughput screening. Together with the nephrotic phenotypes resulting from podocyte injury, this assay makes it possible to unleash the power of the zebrafish system for the study of nephrotic syndrome and related human diseases (e.g., for forward genetic screening of nephrotic fish mutants and for chemical screening for compounds that alleviate proteinuria). Glomerulosclerosis is a major cause of renal failure, and it has been demonstrated that podocyte injury is sufficient to cause glomerulosclerosis.17 However, it is not clear whether zebrafish have glomerulosclerosis after podocyte injury. Nonetheless, future studies into this question using the inducible podocyte injury model we have generated may help elucidate the pathogenic mechanism of glomerular sclerosis or provide insights into how to avoid or reduce glomerulosclerosis. Zebrafish are highly regenerative in multiple organ systems.28,29 As in the kidney of other teleosts,30,31 its mesonephros undergoes neo-nephrogenesis, which is a rapid de novo generation of new nephrons, after acute renal injury.32 The postinjury neo-nephrogenesis is probably due to the capability of continuous mesonephric growth maintained in adult zebrafish.23,33 Diep et al. recently identified lhx1a+ cells as the renal progenitor cells in zebrafish mesonephros that are responsible for neo-nephrogenesis.33 However, whether such a population of progenitor cells exists in adult metanephros of mammals and human is unknown, and continuous nephrogenesis in adult rodents or human has not been reported. It is known, on the other hand, that a population of renal progenitor cells reside at the urinary pole of the Bowman capsule within the metanephros nephron and can differentiate into podocytes after podocyte injury in rodent models.34 In addition, parietal cells on the wall of the Bowman capsule are recruited to become podocytes in rodents.35 Our data showed that wt1b expression appears to mark the same domain of the mesonephric nephron in zebrafish and is reinitiated in cells on the wall of the Bowman capsule, presumably parietal cells, after podocyte injury. This suggests that an evolutionarily conserved intraglomerular repair mechanism may exist in zebrafish mesonephros. It is unclear whether in response to podocyte injury parietal cells in zebrafish reactivate wt1b expression, or whether wt1b-expressing cells migrate from the urinary pole toward the glomerular tuft. Whether these wt1b-expressing cells ultimately differentiate into podocytes also warrants further investigation. Rodent models have been widely used to study glomerular function and diseases, but using optical imaging to observe the intraglomerular structure in vivo is technically difficult. By virtue of their optical transparency, zebrafish kidneys (both pronephros and mesonephros) are easily accessible for optical imaging and provide a model system that permits high-resolution optical imaging of glomerular structure when combined with transgenic techniques. Although the glomerular ultrastructures, such as secondary and tertiary podocyte foot processes and slit diaphragms, are still beyond the resolution of optical imaging, zebrafish models will be promising for high-throughput analyses of glomerular structure with the development of the next generation of microscopes. The renal glomerulus is central to the filtration function of the kidney across vertebrates. However, besides rodent models, no model system is available to permit study of its structure and function. Although several immortalized podocyte lines have been established and provide a useful platform to study the function of glomerular podocyte genes in vitro, the extent that these in vitro systems may represent the podocytes within a functional glomerulus is probably limited. On the basis of our results, zebrafish pronephros and mesonephros will bridge the gap between in vitro podocyte culture and rodent models for renal glomerular research. Given that zebrafish are amenable to high-throughput chemical screening and mutant screening,36 studying this new model system will lead to new insights into the genetic mechanism and therapy for nephrotic syndrome and other renal glomerular diseases. Zebrafish (Danio rerio) were reared and maintained as described elsewhere.37 Embryos were collected after natural spawn, kept at 28.5°C, and staged ashours post-fertilization. A lab-inbred wild-type strain and AB* wild-type strain were used to generate transgenic fish lines. The pod::NTR-mCherry transgenic fish were generated as described elsewhere.23 The zebrafish VDBP (Genbank: NM_001002568.1) coding sequence was cloned with reverse transcriptase—PCR, was fused to enhanced GFP coding sequence and replaced the NTR-mCherry gene in the l-fabp::NTR-Cherry construct.22 To generate the l-fabp::VDBP-GFP transgenic fish, the DNA construct was co-injected with the capped RNA encoding the Tol2 transposase into fertilized eggs. Embryos expressing the transgene were raised to adulthood and out-crossed to wild-type fish to obtain germ-line transgenics. The prodrug MTZ (1-[2-hydroxyethyl]-2-methyl-5-nitroimidazole) is reduced by Escherichia coli nitroreductase and converted into a potent DNA interstrand cross-linking molecule, causing cell death.38–40 To induce podocyte-specific injury, MTZ was added to fish water or E3 medium together with 0.1% DMSO. Zebrafish were treated with 50 µl metronidazole/DMSO per larva and 100 ml metronidazole/DMSO per adult fish. To observe postinjury response, adult fish were treated with 2 mM metronidazole/DMSO for 48 hours and allowed to recover for 48 hours after the withdrawal of MTZ/DMSO. We used 0.1% DMSO as the vehicle control in all experiments. Double transgenic fish were generated by crossing pod::NTR-mCherry and l-fabp::VDBP-GFP fish and were subjected to the induction of podocyte injury aforementioned at specified developmental stages. To measure GFP leakage with ELISA, 20 embryos per well were placed into 12-well plates at 3 dpf and treated with MTZ in E3 medium overnight and 100 μl of medium was assayed using the GFP ELISA kit (Cell Biolabs, San Diego, CA) following the manufacturer’s protocol. Each treatment group and ELISA assay were duplicated. Immunohistochemical staining was carried out as described elsewhere.42 Antibody against cleaved caspase-3 (BD Biosciences) was used at 1:200 and antibody against GFP (Invitrogen) at 1:500. The confocal images were captured with a Leica SP5× laser scanning microscope, and other fluorescent images were captured with a Leica M205FA stereoscope. The images were processed with Leica AF and Leica Application Suite. To quantify the mCherry fluorescence, images of dissected mesonephric kidneys were captured with Leica M205FA stereoscope, and fluorescence intensity were measured using Leica LAS 3.7 software. Five mesonephric glomeruli were measured from each fish in both the MTZ-treated group (n=6) and the DMSO-treated control group (n=5). A one-tailed t test in Microsoft Excel 2010 was used for statistical analyses. The authors thank Dr. Roger C. Wiggins and Dr. Iain A. Drummond for enlightening discussions, Mr. Sasha Meshinchi for technical assistance for transmission electron microscopic analyses, and Mr. Rudrick C. Boucher for fish care. Dr. Didier Y. Stainier, Dr. Michael J. Parsons, and Dr. Koichi Kawakami generously shared relevant constructs. This work is supported by National Health Institute grants to W.Z. (DK091405) and F.H. (DK076683 and DK086542), the Nephcure Foundation, and the Center for Organogenesis of the University of Michigan. F.H. is the Frederick G.L. Huetwell professor, a Howard Hughes Medical Investigator, and a Doris Duke Distinguished Clinical Scientist. See related editorial, “A Photo Shoot of Proteinuria: Zebrafish Models of Inducible Podocyte Damage,” on pages 969–971. This article contains supplemental material online at http://jasn.asnjournals.org/lookup/suppl/doi:10.1681/ASN.2011080776/-/DCSupplemental.